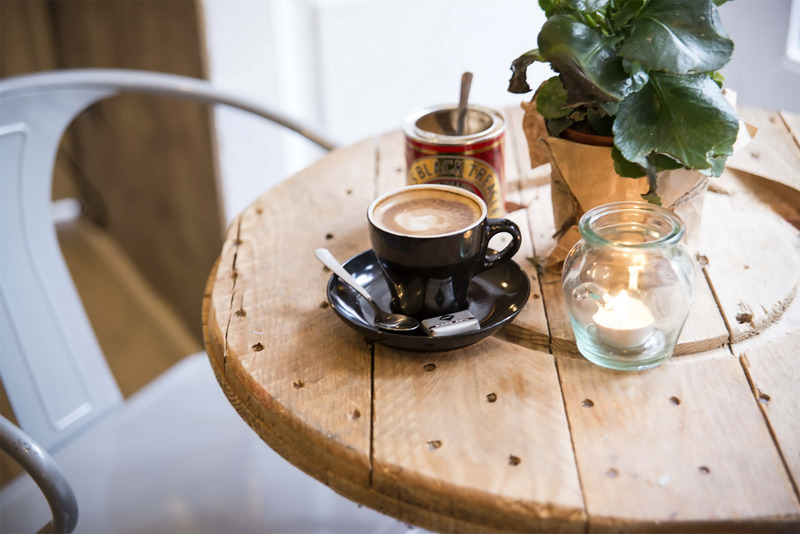 Here at Suites You we have curated a list of Madrid’s top places to enjoy breakfast, dinner, tapas and anything in between. Don’t miss out on this selection of some of the best traditional, fusion and trendy restaurants in Madrid, and take the chance to immerse yourself into this city’s wonderful cuisine. Their assortment of great coffees and seasonal varieties will satisfy all coffee lovers and allow you to always try something new. At Toma Café they’re committed to preserve their coffees’ original qualities, enhancing their sweetness and developing the perfect roast profile for your preferred presentation, whether it’s filter coffee or espresso. In addition to their world class coffees, Toma Café offers delicious sandwiches and homemade pastries and desserts. At this beautiful shop located in the Alonso Martinez area, you can buy everything on display. Coffee is the star of the show, though. Good organic, balanced and healthy coffee. It’s roasted and mixed by a small national producer exclusively for Cripeka. Their fresh milk will suit all preferences and sensitivities and you should definitely get their homemade pastries –grandma’s recipes– or their delicious sandwiches to accompany the coffee. Everything on the menu can also be taken to go. Just ask or take it from the shelves or the fridge by the entrance. Their menu consists of a selection of a carefully chosen natural products as well as delicious homemade recipes, both sweet and savory, which you can eat in or take away. 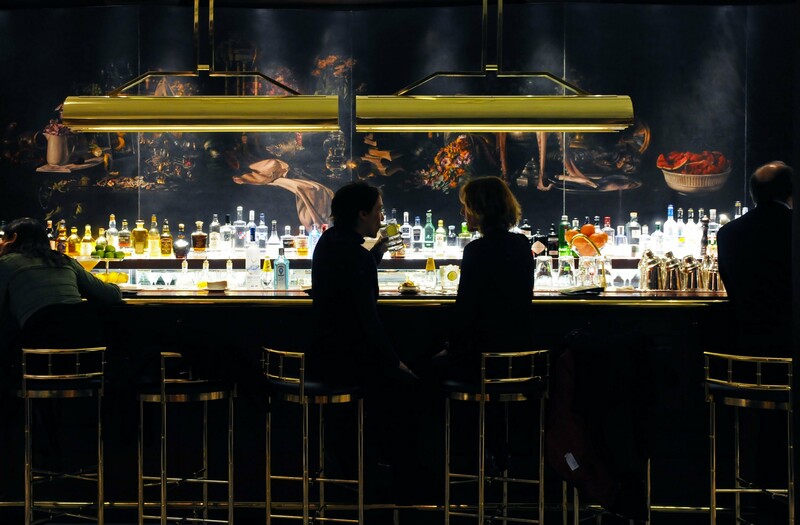 Discover their distinctive atmosphere which innovatively combines London and Madrid. You’ll experience what it’s like to taste quality ingredientes lovingly made and served for you. 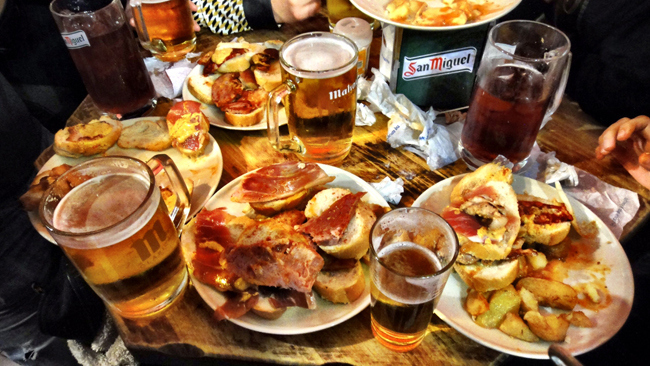 If you love beer, tapas and La Alhambra, this is your bar. 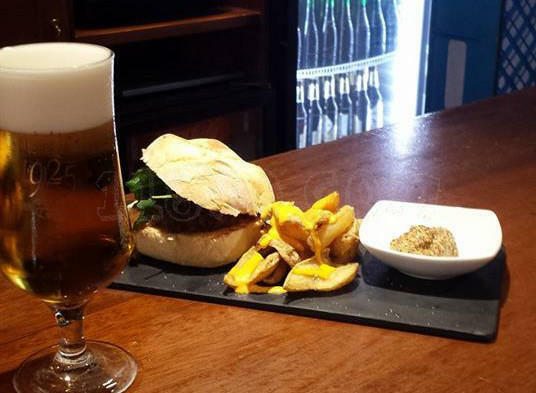 Enjoy a caña, and choose among their 22 different tapas to go with it, particularly the bienmesabe (fried marinade dogfish) and the molletes (made with Spanish bread, olive oil and other Mediterranean ingredientes). El Tigre is one of those long-standing joints in Madrid, a true classic. if you haven’t tried a beer doble at this cider bar you don’t really know Madrid’s genuine tapas. El Tigre is known for the size of their beer dobles as well as their generous servings of delicious tapas. 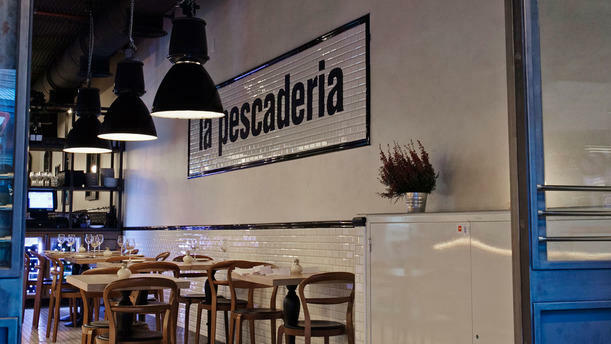 La Pescadería is one of the essentials of Madrid’s TriBall area —regarded by many as the mischievous neighbourhood of the city— where a host of very traditional long-standing shops share the streets with Madrid’s avant-garde fashion, cuisine and leisure. 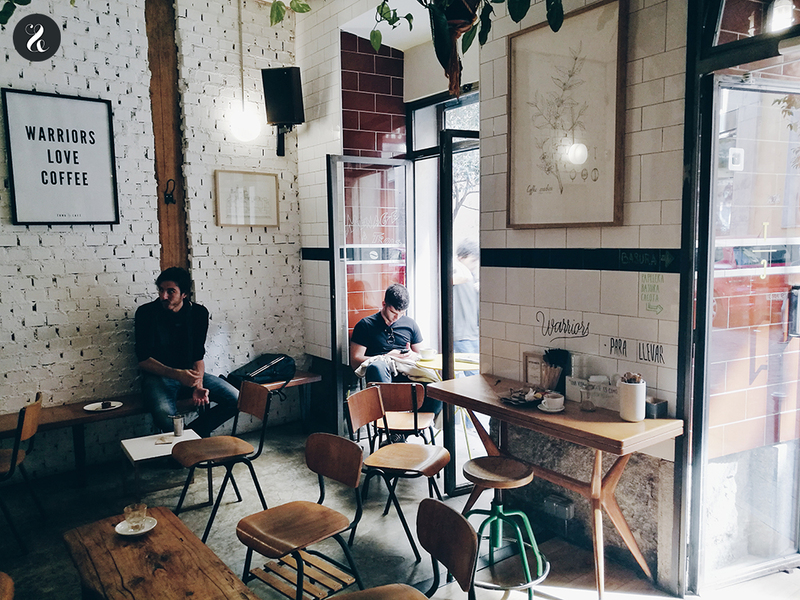 Hipster beards and tattoos share the space of La Pescadería with important figures of Spain’s culture, fashion and cinema, as well as those bold tourists and families that decide to venture into this most genuine piece of Madrid. Their specialty is traditional Spanish cuisine with highly innovative twists. Pop in at the vermouth hour and indulge yourself with a serving of boquerones en vinagre con patatas fritas (marinated fresh anchovies with French fries) or their ensaladilla “rosa” (a variation of the classic Russian potato salad). Calle de la Ballesta, 22. Created by celebrated chef Diego Guerrero, its name stands for “Days to Smell Taste Amaze Grow & Enjoy”. 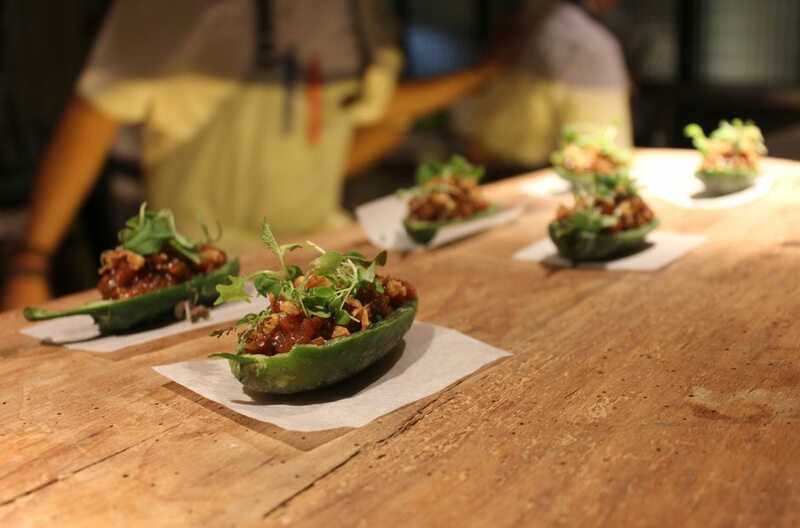 Guerrero’s first entrepreneurial endeavour, this haute cuisine restaurant follows the so-called “quiet revolution” trend of recent years, while still faithful to his own philosophy of “high-level cuisine without the fuss” which earned him a Guía Michelín star in both its 2016 and 2017 issues. 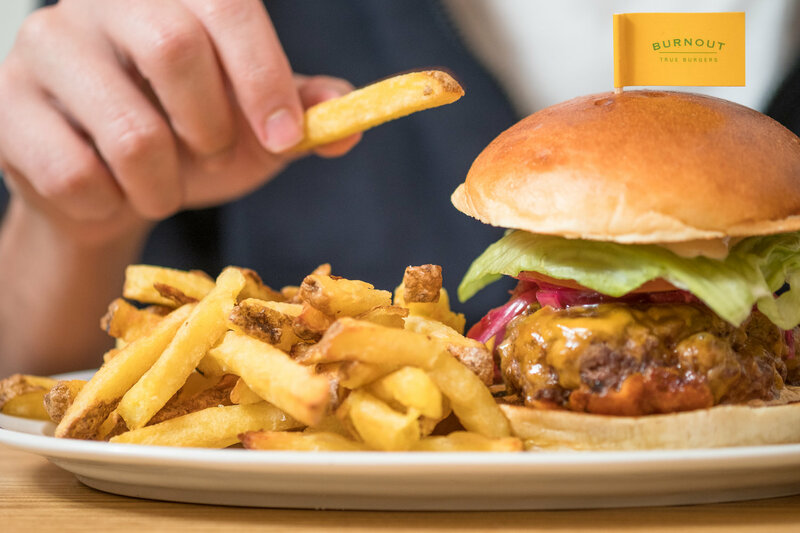 A true heaven for meat lovers, Burnout make their hamburgers carefully selecting different cuts of fresh beef (they never use frozen beef). They buy their meat in a totally unprocessed state, and then they clean it, cut it, and grind it twice a day in order to guarantee not only their absolute freshness but also that the hamburgers contain absolutely nothing that should not be in them. Just pure unadulterated 100% fresh beef. Authentic Neapolitan pizza. You may have eaten an inordinate number of pizzas in your life, but you’re likely not to have tried the original one. The team at Grosso Napoletano want to share with you Naples’ most sought-after secret: La Verace Pizza Napolitana. 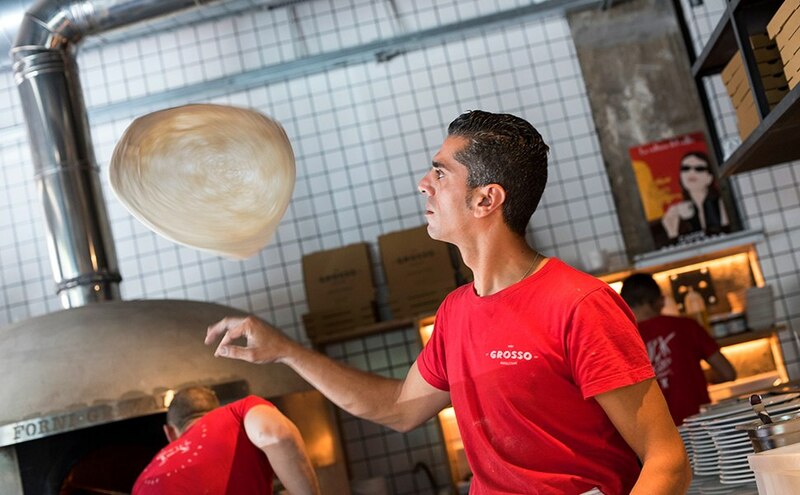 All their Neapolitan pizzas are baked for 60 to 90 seconds at 500º Celsius, in a traditional oven handmade in Naples by the fourth generation of a family of craftsmen. The dough is made with italian hard flower, then it’s left to rest for 48 hours so that it gets a second fermentation, thereby resulting in a thin, soft, and elastic base, with thick spongy border and delicious texture. The authentic Neapolitan pizza is made with top quality Italy-imported ingredients, such as San Marzano tomatoes and Campana DOP Mozzarella, making this pizza a culinary work of art. To top it all off, their pizzaiolos come directly from Naples to ensure that the pizza-making tradition is painstakingly followed. 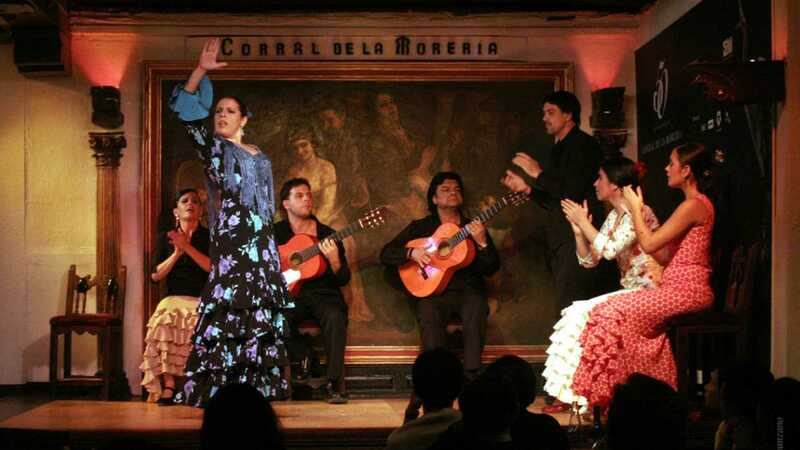 Corral de la Morería is the World’s most prestigious flamenco stage. A temple for true artistry, it has become one of Spain’s top landmarks. 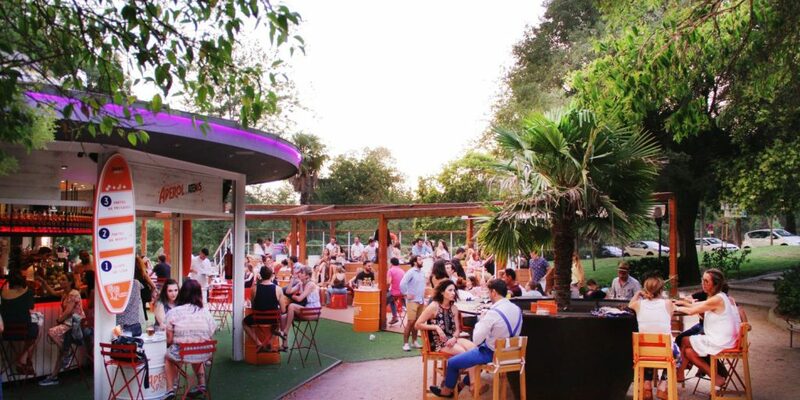 Located in Las Vistillas park, right in La Latina district at the heart of Madrid, all of the most renowned flamenco artists of the past century have grazed its stage. Equally impressive is the Restaurante Corral de la Morería, the most intimate project of Del Rey’s family. It only has four tables —making it one of Europe’s smallest— as the perfect setting for their gourmet menu. Its cosy and laid-back atmosphere is perfect for enjoying the experience of having a renowned chef cook exclusively for a group of no more than eight people, with a maitre and a sommelier focused on making your dinner absolutely perfect. A feast for the senses further enhanced by the carefully chosen wine and food pairings, with their choice of fortified wines being the house specialty. 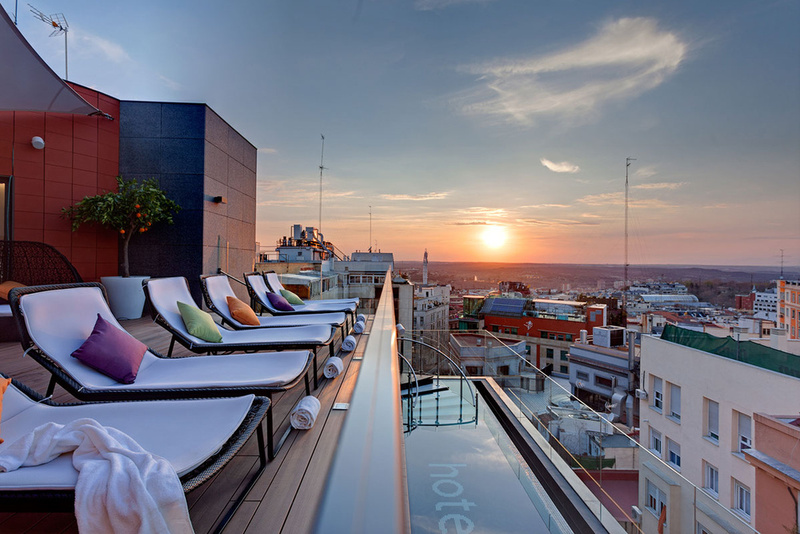 Enjoy one of Madrid’s most spectacular views in this fantastic terrace on the 12th floor of the Hotel Índigo. Watch the whole city while enjoying the cocktails, gin and tonics or milkshakes made by their expert mixologists. Their so-called Sky Lounge is their cosy summer terrace. It opens to the public until 11pm and its vibe will draw you in to chill out and unwind. It boasts an artificial wood for a cheerful and fun ambiance thanks to its great variety of colours. Come in and taste their wide selection of cocktails, a serving of fine jamón ibérico, or any of their wide range of snacks, while surrounded by an unparalleled setting. 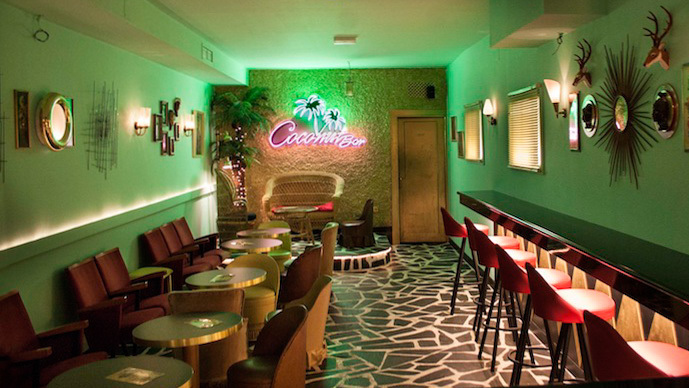 Located in the Malasaña area, this bar boasts a striking Hawaiian decor and 50’s ambiance, and is owned by artist Silvia Superstar. Its two floors are decorated with items like luminous palm trees and wickerwork, setting the tone for a laid-back atmosphere which anticipates the selection of drinks on offer. 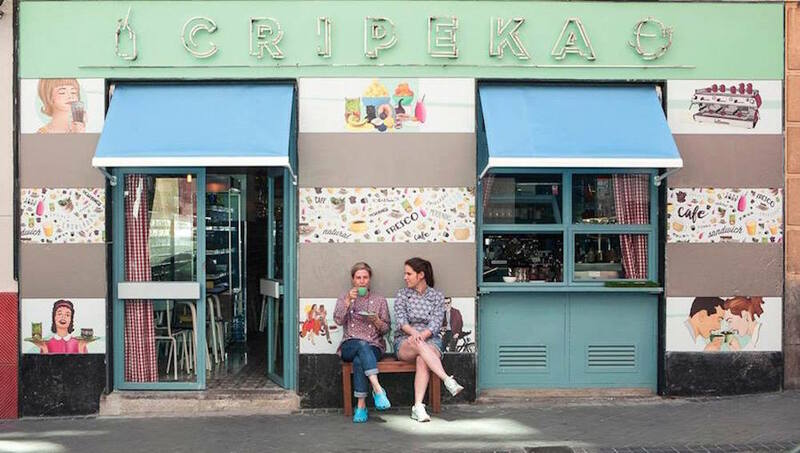 Their cocktails and milkshakes are not to be missed —particularly their Daiquiri and Piña Colada— but they also have coffees and cakes for a nice afternoon snack. The venue resembles the American culture of the 50’s and 60’s, thanks to elements like the furniture imported from Los Angeles and Las Vegas, or the selection of music typical of the period such as soul, surf, doo-wop or rhythm & blues. 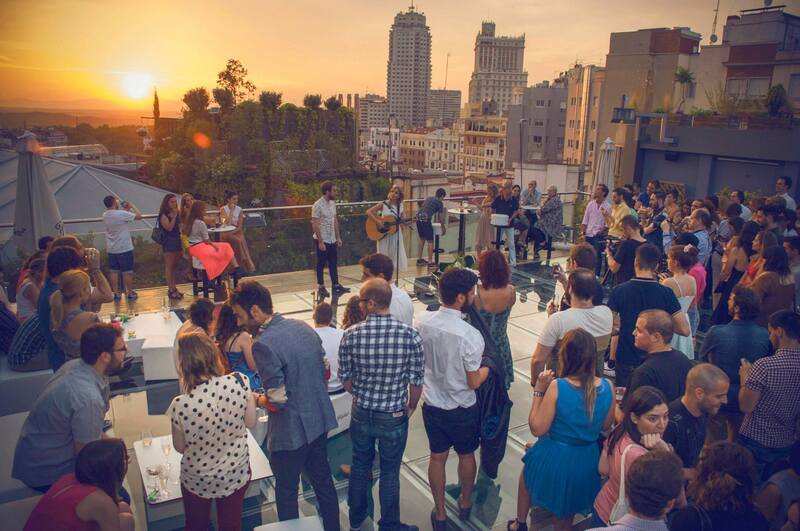 Located by the Cuesta de la Vega street and boasting impressive views of the Almudena Cathedral and its park, Terraza Atenas will make for great long evenings full of unforgettable moments thanks to its intimate and relaxing atmosphere. Its beautiful kiosk and quiet terrace are the perfect setting to enjoy the surrounding nature, the trees, the gentle breeze… Trying their cocktails and wide selection of very tasty gin & tonics is an absolute must. Dry Martini By Javier de las Muelas at The Gran Meliá Fénix Madrid is based on the same concept as its sister bar of the same name in Barcelona. It follows the same philosophy so its top-quality mixology has the same distinctive style and high standards. The Dry has a laid-back atmosphere where you can enjoy a great variety of tapas as well as creative cocktails. 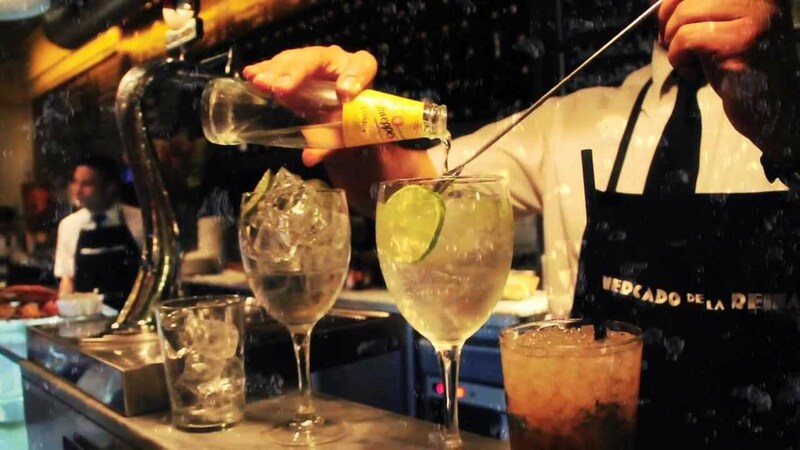 Gin Club is the new idea by Mercado de la Reina for those who love gin & tonics. The place has two separate spaces: the bar area, and the sitting area for those who want to enjoy a good conversation or the chill-out tunes. And while we’re talking about gin & tonics, note that there are more than 40 varieties of gin at your disposal. Plus, the menu of Mercado de la Reina will always be available in case that you get peckish.